After consulting my dad about what kind of knit product Grandma might like best, we settled on a tam or beret style. I’m not great with too many colours (I’m very impatient and too many ends to weave in would drive me nuts), so I wanted something basic. I chose Amaryllis Hat by Mary Ann Stephens after coming across another Raveler’s project. While many of the projects for this hat used a few colours (gorgeously, I might add), hers was beautiful and basic. In the end, because I’m rubbish at colour-selection went with the same colours she used, as her hat came out perfectly. I used KnitPicks Palette in Garnet Heather and Oregon Coast Heather. The first go with the hat did not work out. It’s not the pattern’s fault at all. The pattern is very easy to follow, as is the chart. This whole hat just ended up being a big learning experience for me. I was knitting too tight, not giving the floats enough room, and everything was looking all squished and pinched. I was almost in tears with frustration on this. I ended up ripping back to the brim, the last point where everything looked nice, and started again. I did some research and discovered the source of my problem. When I knit, I tend to work quickly and with the stitches near the tips of the needles. Somewhere I read to keep the stitches down away from the tips. It automatically stretches the yarn out a little bit to keep things from getting too tight. Combining that with slowing my pace down, things started to turn out better! I’m now very happy with how the hat turned out. It’s my best colorwork yet, and I now feel more confident to try other projects. 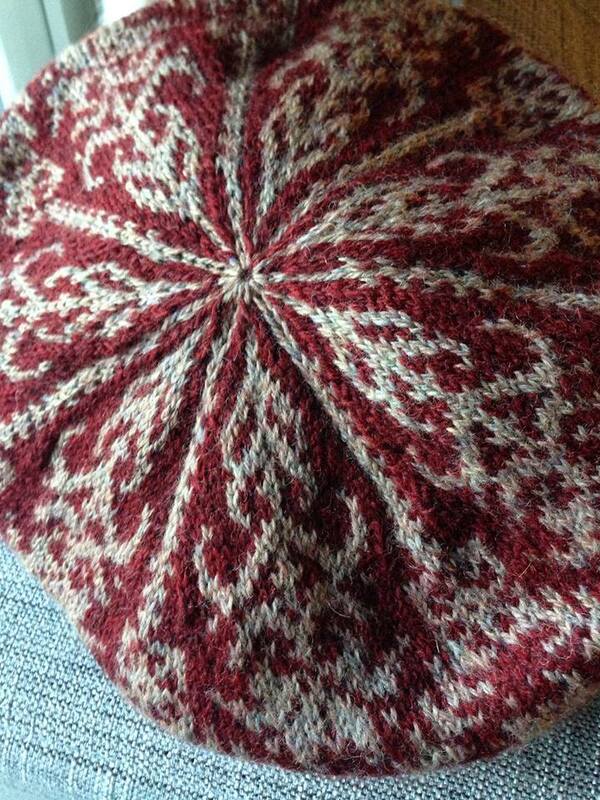 I’ve blocked the beret shape so far, but need to to do the brim yet. I only just got gauge, so I need to be very careful not to make the brim any wider. Otherwise the hat won’t fit at all, and I’ll need a new present for Grandma. Are you knitting for the holidays? What a beautiful hat! Your grandmother will wear it proudly. The beret looks great. Well done. For the next one you make, you might consider knitting in some elastic thread during the first six rows or so. That will keep the hat tighter around the head and it won’t fall off or blow off in the wind. Oh I like that idea! I’ll have to try that. Thanks! Looks beautiful, so intricate! I haven’t been brave enough to try colorwork yet, but I do love how it looks. I knit several presents for the holidays, when I have good ideas for people who appreciate it. What I’m doing differently this year, after a stressful knitting season last year, is starting much earlier. I’ve got the projects all planned out, I’ve got one done and one halfway done, and I have the yarn for all the others. My favorite thing about knitting gifts is that it gives me an excuse to buy more yarn, and a feel-good reason to knit! Beautiful job. I’m knitting a hat for my dad, baby stuff for my niece, probably a few more things to pass the time. Lovely colors and beautiful knitting! Good tip to know! I also love that you kept it simple it looks great! A beautiful piece of colourwork. You are entitled to feel absolutely delighted with this as I am sure your grandma will be. Last year all my small family got a handmade gift. This year, I have not yet decided. If I do, my gran will also be the top priority. It’s beautiful! I’m going to have to keep that in mind about tension. I’m doing a pair of Sanquhar gloves just now (first ever color work or gloves, meep!) and find I keep tightening. I’ll try that and see how igoes. That is gorgeous 🙂 Im not planning on knitting anyone anything this year (yet..). My mum is always very excited when I give her something knitted, but for Mothers’ Day I gave her knitted handwarmers and slippers, so shes set for a bit! Oh yeah…Christmas! Sheesh! Totally got distracted! Heehee!! That’s fabulous,I’m sure your grandma will love it. I’ve been thinking about Christmas presents too, but if I knit anything it will probably be in chunky wool so nice and quick. What a gorgeous present! I’ve just discovered tam patterns, and I am hooked! Yours looks great! That’s beautiful. Love the colours.